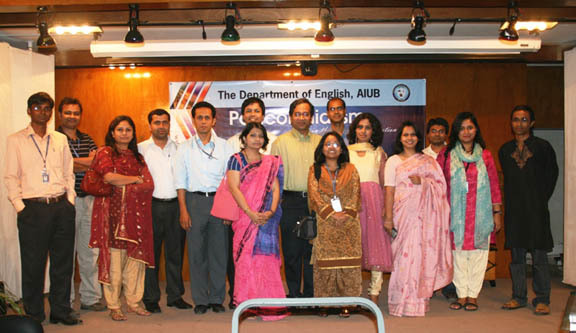 AIUB’s Department of English organized an interestingly interactive colloquium titled “Postcolonialism in the Era of Globalization” on 17 March, Tuesday, at the AIUB auditorium. 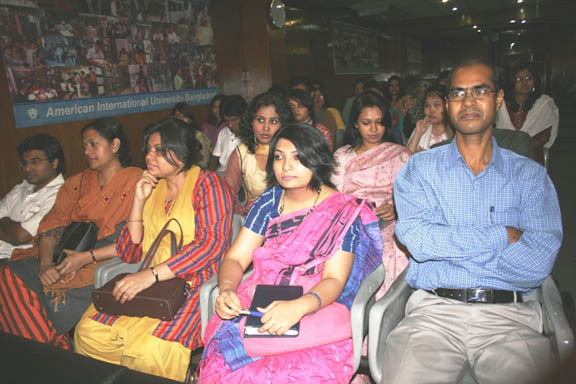 Dr. Fakrul Alam, Professor of English at the University of Dhaka and currently the Advisor of the English Department at the East West University, was the main speaker. The colloquium, which was attended by faculty members and students of AIUB as well as faculty members of other prominent universities, featured lively discussions on Postcolonialism from ideological and geopolitical perspectives. 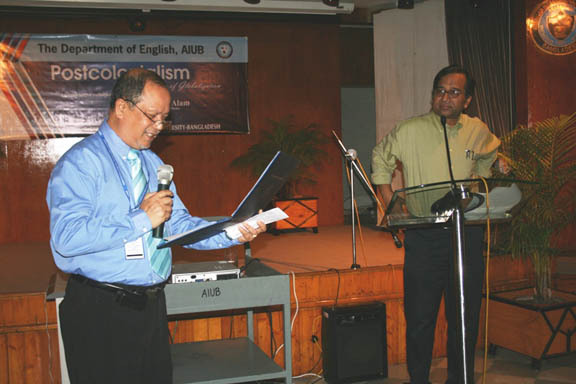 After a brief introductory address by Dr. Faheem Hasan Shahed (Head of the English Department), Dr. Charles C Villanueva (Dean of Arts and Social Sciences Faculty) introduced Prof. Fakrul Alam and highlighted his scholastic achievements in the literary field. He then welcomed all the guests from other universities and wished the colloquium a success. 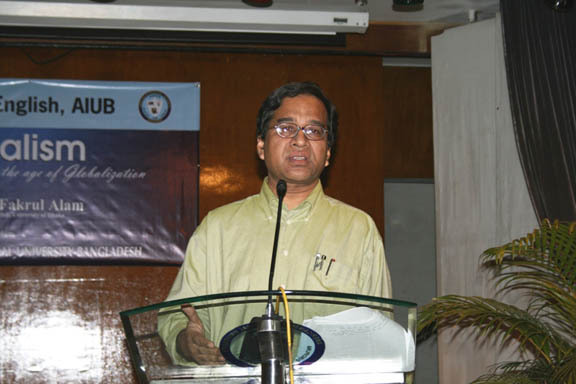 In his eloquent, scholarly deliberation, Prof. Alam explained how the understanding of postcolonialism is inextricably related with the understanding of colonialism, and how we all need to rejuvenate our thoughts for the rediscovery of our ‘selves’—wiping out the Euro-centric colonial mindset hidden inside us. Prof. Alam argued with interesting examples how the powerful nations, in the name of globalization, have propagated the “corporatization of the world” and have led us to believe that emancipation would arrive only through their outlook and framework, instead of ours. And in believing so, we have adopted ourselves in the Postcolonial cosmopolitanism, in the brand name of “globalization” — eventually allowing them to overwhelm us in all sorts of ethical, academic, linguistic, political and otherwise terms. He therefore stressed on the importance of adopting “internationalization”. Prof. Alam’s speech was followed by a lively question-answer session—both by the faculty members and students. 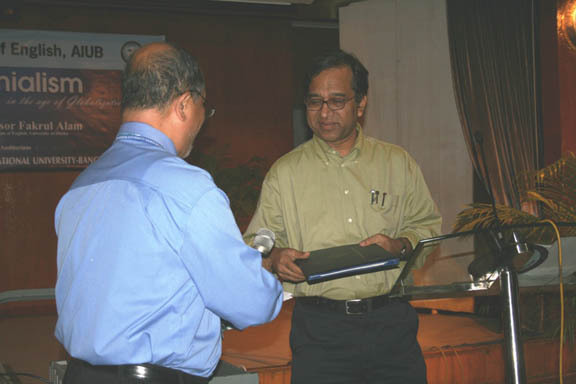 Amid loud applause, Dr. Charles thanked Prof. Alam for his wonderful presentation and presented him with AIUB gift-pack and a special Certificate of Appreciation on behalf of the Vice Chancellor. A delightful snacks-&-coffee session followed right after that.